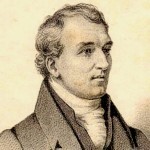 David Douglas was born in Scone, Perthshire, Scotland. He was a Scottish botanist. He worked as a gardener and explored the Scottish Highlands, North America, and Hawaii, where he died. He spent seven years in this position, completing his apprenticeship, and then spent a winter at a college in Perth to learn more of the scientific and mathematical aspects of plant culture. After a further spell of working in Fife he moved to the Botanical Gardens of Glasgow University and attended botany lectures at the University of Glasgow.